2. You don’t need to build a website. What scares people more than creating a product is building a website! What in the world is HTML? How much does the software cost? How do I upload files? Why isn’t it formatted correctly? Why don’t my graphics look like the ones the pros have? If you are a complete beginner, it can be very difficult (even using templates) to get an attractive website in place. And hiring a professional to do it for you is out of the budget for most people. BUT, with affiliate marketing, you don’t need to build a website! You simply send visitors to someone else’s professionally designed site through your affiliate link. 3. You don’t need to write a world class salesletter. Have you ever tried to write a salesletter? There’s a reason why professional copywriters charge up to $10,000 (and sometimes even more) for a SINGLE salesletter. It takes a lot of experience and skill to write a top-gun salesletter, which is why most people have a hard time convincing people to buy if they do create their own products and website. They simply don’t have the right salesletter in place to make it all work. BUT, with affiliate marketing, you don’t need to write a salesletter! You simply direct people to someone else’s high-octane salesletter for THEM to convert your leads into commissionable sales. 4. You don’t need to manage an entire business. While it can be quite lucrative, running an entire business with employees, inventory, partners, vendors, and other associates can be a time-sucking, frustrating ordeal. Imagine processing refunds, putting out fires when partners SPAM, managing day-to-day operations, overseeing projects you’ve outsourced and all of the other “stuff” that business owners do. Didn’t you want to start an internet business to make more time for important things in life? It can be a lot of extra work and stress. BUT, with affiliate marketing, you don’t need to manage an entire business! 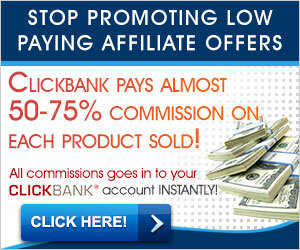 You are simply responsible for promoting your affiliate link… someone else handles all the rest. 5. You don’t need a big budget to make it work. Do you have any idea how much money is spent running an internet business? There are monthly fees for autoresponders, hosting, management, advertising, scripts, and more. There are regular fees for licensing, outsourcing, support, customer service, maintenance, development, recruiting and more. It’s not uncommon to spend tens of thousands (even hundreds of thousands) of dollars in operational costs — which is fine if you’ve been in business a while and are making the bucks. However, if you’re a newcomer, it can be taxing on your budget! BUT, with affiliate marketing, you don’t need a big budget to make it work! You can simply use a variety of free and low-cost marketing methods to generate clicks to your affiliate link. Is short and easy to digest. Most lessons are only 5-7 pages in length and contains nothing but “meat”. There is a very real problem with “information overload” where the reader simply has too much information to absorb. Each lesson is purposefully brief (but thorough!) so you can quickly read it and put it into practice. While some lessons do stretch into the 20-25 pages range, these are usually “multiple ideas” type lessons … in other words, “here are 27 ways to XYZ — pick one that you like best and get started”. Includes An Action Step To Complete. Every weekly lesson has SOMETHING FOR YOU TO DO – it’s actionable! Instead of giving you the usual “this is what I’ve done” stuff, I’m giving you “this is what you do” stuff! Each week you’ll have some easy-to-implement action step to complete before moving on. Forces You To Succeed Long-Term. While most ebooks and traditional membership sites (and even some high-priced coaching programs) pile on a bunch of information and leave you to put it all together for yourself, that isn’t how things are setup in this training program. By giving you information in bite-sized portions for a full year (52 weeks!) you’ll be more likely to actually do something with the content … and you’ll be more likely to see real results for yourself. Getting started the RIGHT way in affiliate marketing … your ready-made plan of attack for building big commission checks. The mistakes most affiliates make that cost them sales … and how to avoid them almost effortlessly. 3 “must-promote” affiliate programs within ANY market that you must promote to rev up your monthly commission checks. How to get member “on-demand” resources created by yours truly to equip you with anything you need to see results. The introductory lesson you’ll receive immediately will explain a basic overview of how to get started with affiliate marketing, along with a detailed tutorial for choosing the right affiliate program product to promote for maximum profit. Then, we’ll take the next 52 weeks to examine one simple way per week to promote your affiliate link in just 1-3 hours. Everything will be explained in step-by-step format, along with relevant examples. Intermingled throughout the series will be all the “on-demand” resources you and your fellow students can dream up for me to create. Literally, everything you need to succeed as an affiliate is included. < << < < < < ""